Why Are Diamonds Used in Drills? How Does Marble Get Mined From a Quarry? Diamonds aren’t just frivolous jewels bedazzling necks, wrists and fingers worldwide. They’re also one of the toughest materials on the planet. Once thought to be hardest known substance, it now has a few competitors for the top spot. But it still takes powerful tools and incredible expertise to cut through the rough stone and transform it into a priceless gem. Diamonds do not come out of the earth looking like glittering jewels. Instead, a diamond before cut is a rough, milky stone with jagged edges. It’s a diamond cutter’s job to take those irregular rocks through the diamond process. To do so takes five main steps: planning, cleaving, bruting, polishing and inspecting. The planning stage is critical, since workers must analyze the rock and figure out how to make the smartest possible cuts to minimize waste and make sure they get the highest possible value from the stone. After determining how to proceed, diamond cutters move on to the cleaving stage. It’s also sometimes called the sawing stage, because this is when jewelers make the first big cuts to the stone, separating it into individual gems. Since a diamond is too hard to be cut by many of the materials often used to make saws, jewelers traditionally cut the stones with a saw whose blade is made of diamonds, a diamond saw. Recently, they have also begun to use lasers to split the rocks, especially if a stone is particularly jagged and could benefit from a contactless cut. Following the cleaving stage, jewelers move on to bruting. During this step, the diamonds are cut once again, this time to make the stones round and easier to work with. Jewelers usually use lasers or a rotating disk in which two diamonds spin in opposite directions from each other. As they spin, they grind against each other, working each other down into round shapes. 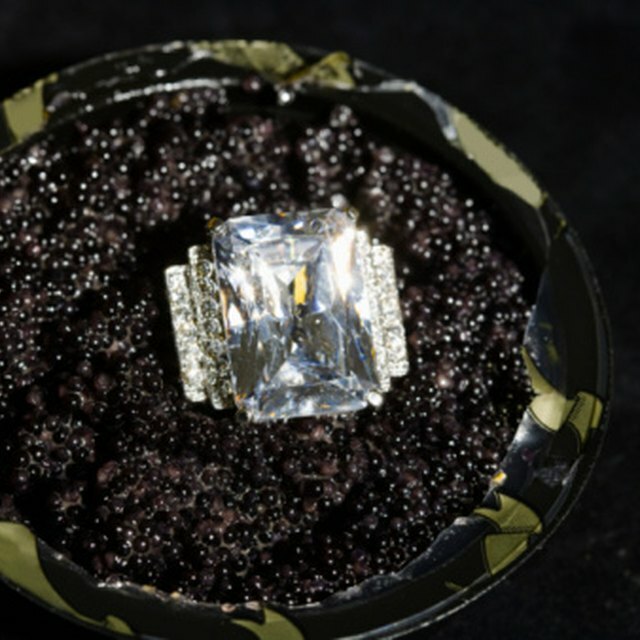 This was traditionally done without any technological help, but now many diamond cutters use computer software to help them analyze the cuts, maximize precision and guarantee future buyers that the stone was expertly cut. Next is the polishing stage, where a jeweler cuts the stone into its final form. Here, the diamond cutter uses a spinning wheel to create the smooth facets for the specific stone. Then, a worker called a brillianteer comes into the add the final facets, giving the stone the clarity and radiance that makes it a marketable diamond. Lastly, a diamond goes through the inspection phase, where experts make sure it meets quality standards. Which Diamond Shape Looks Biggest For Carat Size? There are several questions you can ask a jeweler if you want a diamond to have good spread. First, the Gemologist Institute of America issues cut grades on diamonds, evaluating the quality of their facets, angles and cuts. Look for stones with a cut grade of “Excellent.” Next, check out the shape. Round diamonds are great at reflecting light and appearing big, brilliant and radiant even if their carat size is relatively small. An understanding of the entire diamond cutting process can help ensure that you’ll get a lot of bang for your buck with your diamond purchase. Rachelle Dragani is a freelance writer based in Brooklyn with extensive experience covering the latest innovation and development in the world of science. Her pieces on topics including DNA sequencing, tissue engineering and stem cell advances have been featured in publications including BioTechniques: the International Journal of Life Science Methods, Popular Mechanics, Futurism and Gizmodo. Dragani, Rachelle. "Tools Used to Cut Diamonds." Sciencing, https://sciencing.com/tools-used-cut-diamonds-4690850.html. 20 July 2018. Can Scratches Be Polished Out of a Sapphire Crystal?